When we found out we were having a second girl, we decided to give Claire the new room and let Maddy take Claire's old room. 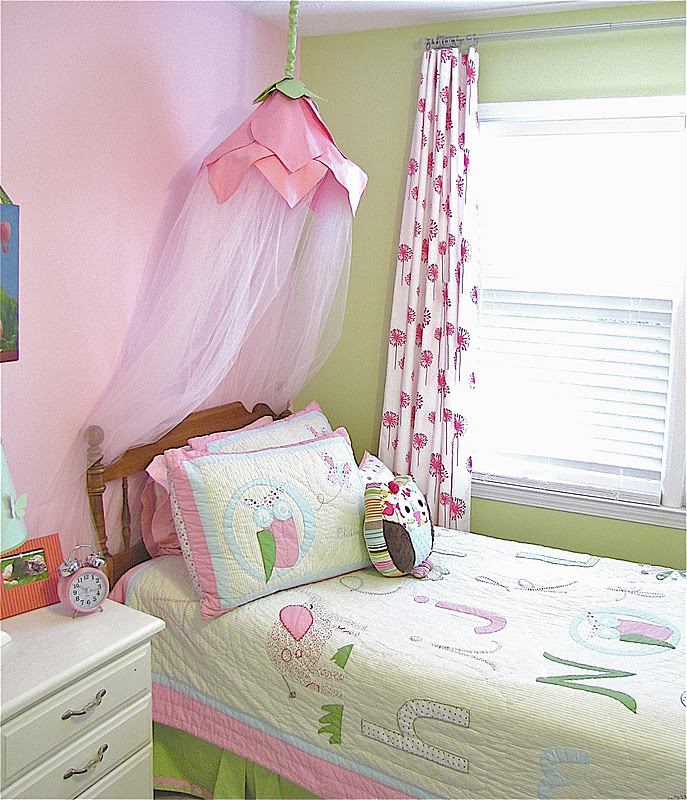 To make Claire feel special she got to help me design her "big girl room." Her tastes are somewhat eclectic (Matt sometimes comments that her room has many themes) but it's for her and she loves it. 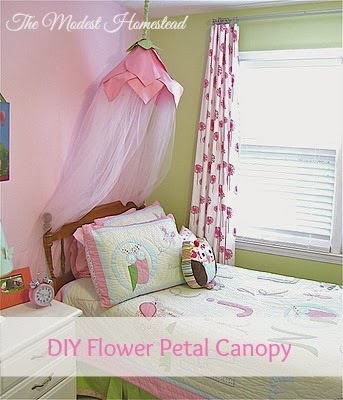 One of the first things she picked out was the Rose Petal Canopy she saw in the PB kids catalog. She calls it the "princess bed." But since I hate to buy something when I can make it myself I decided to give it a try. I love how it turned out and thought you might enjoy it for your little princesses as well. Here's how I made it. 19 yards of tulle off of the bolt (I originally made it with 9 and added more to make it more fluffy so you could go either way.) You will use 18 for the bottom canopy part and the extra one is used for hanging. 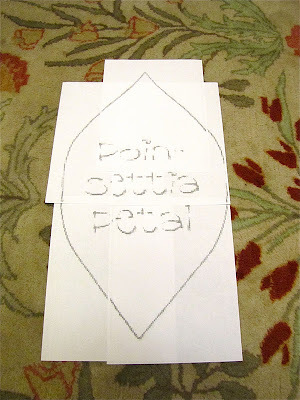 First I searched online for a petal template and found one here. I printed out the sheet of petals and cut out the one I wanted to use. Then I put it in my copier and blew it up at 400% which is the largest my copier would let me. So it came to the size on the right. 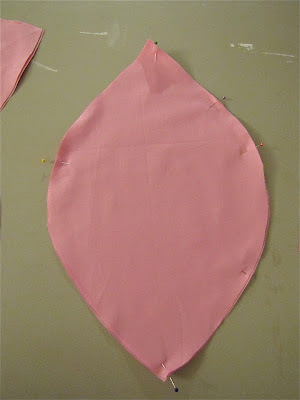 I used this size petal as a pattern for my small green petals at the top of the canopy. It measures 4 1/8"W x 7 1/4"L at its widest points. I put the bigger one in the copier and blew it up at 300%. Since this is larger than one piece of paper you have to print it out in sections. So I placed my petal template on the copier so that it would only copy a corner at a time. I had to experiment a few times with the placement until it came out right. 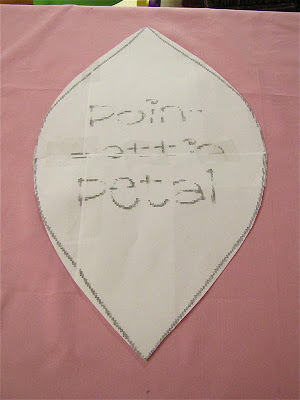 The large petal measures 12"W x 21"L. You could draw your own petal patterns which would be easier I'm sure. I think sometimes I just prefer to do things the hard way. 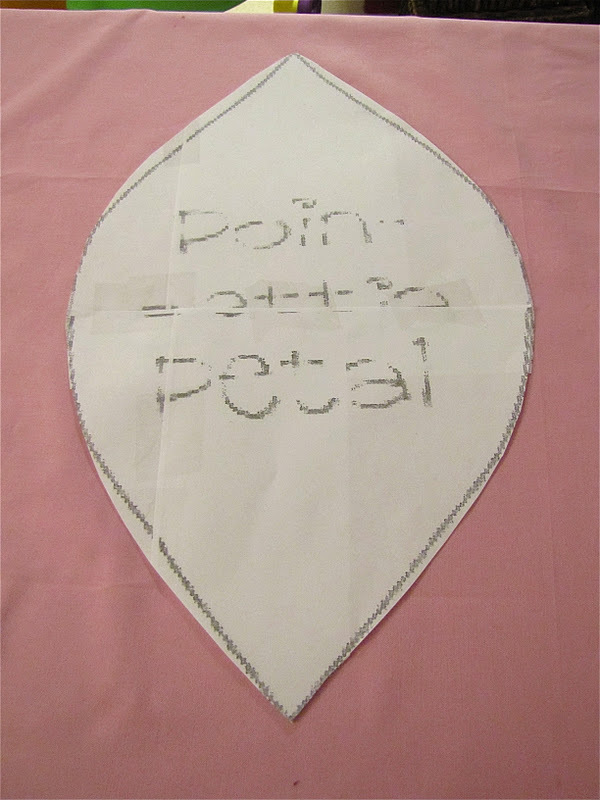 I've listed the measurements of each petal in case you want to draw them yourself. Now there are 5 different pieces of the petal. I put the pieces together to form the petal and taped them to secure. Then cut out the pattern. For the medium sized petals. You will use the petal piece that you blew up to 300% in the beginning and blow it up again to 250%. I liked the width that this came out but I wanted the petal to be a little shorter. I taped the two top pieces together and the two bottom pieces together separately. I wanted my medium petal to be about 4" above the bottom of my larger petals so I put it on top of the petal to determine how long to make it. I pushed the bottom piece of the petal up and taped it in place. My medium petal measures 10.5"W x 17" long. Now put them right sides together and pin in place. 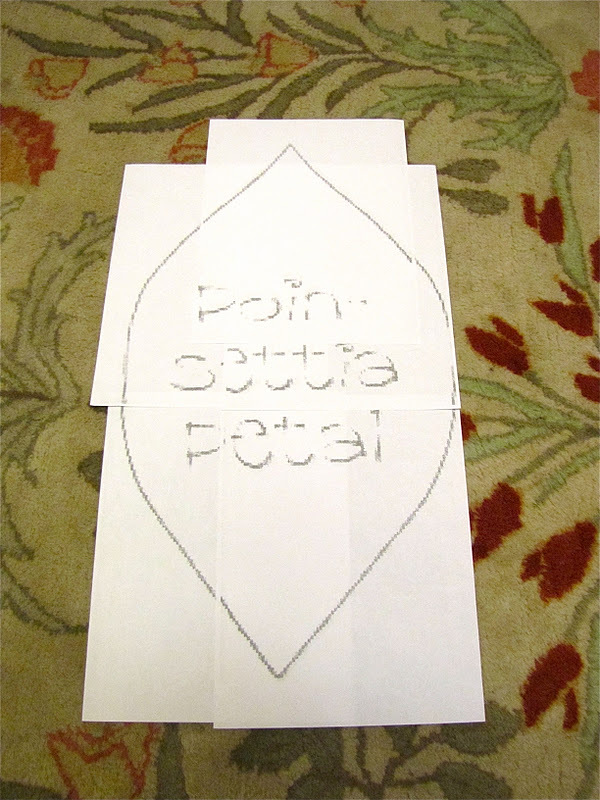 Mark about a 3" space to leave open so you can flip the petals right side out. Now sew them in place making sure you leave your 3" space open. 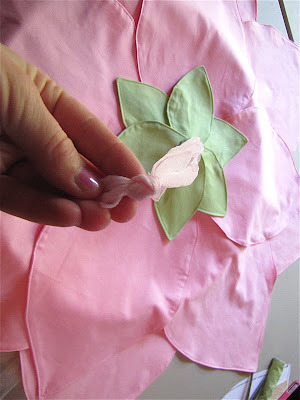 Clip your threads and trim the seams around the petal points. Flip them right side out and iron flat. Then you're going to turn in your opening and iron it. Now sew your opening shut. I continued sewing all the way around the edge of the petal to give them a more finished look. 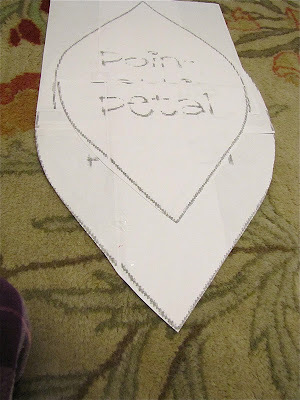 Next I added button holes to the top of each petal. Measure about 1/2 down from the top of the petal. Draw a 3/4" line to mark the guide for your button hole. I pulled the tulle through the holes to connect them and create the flower. Sew all your button holes. Here are the 6 green petals using the small petal pattern. 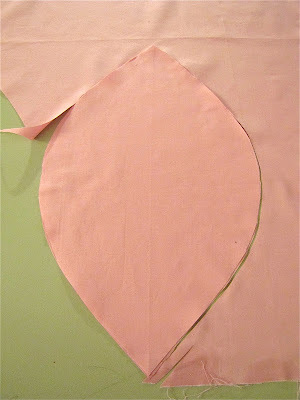 So now you should have 8 large pink petals, 4 medium pink petals and 6 small green petals. Set them aside. Now you are going to work on the embroidery hoop. I used sharp scissors to cut my hoop in one place so I would have an opening to slide my tulle onto. Then wrap the hoop with ribbon leaving a few inches on either side of the break. You will need to put the break back together before you wrap it. Secure the ribbon to the hoop with hot glue at the beginning and the end. The first time I made this canopy I didn't do this and it made it difficult to slide my tulle onto because it kept getting caught on the wood. Plus it gives it a nice finished look so you don't see the bare wood. I rolled out my tulle and cut it out into 6 sections running the width of the fabric. Each section measures 9 feet (3 yards) long. You should have one extra yard left over. Set it aside to use for hanging the canopy. 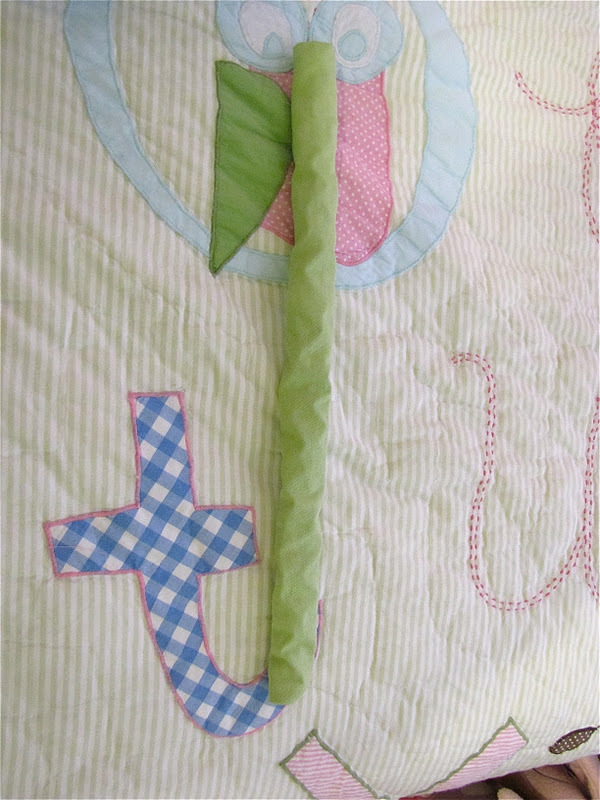 Then I took the top end of each section and folded it over about 2". Sew it so that you will have a pocket to slide your hoop through. 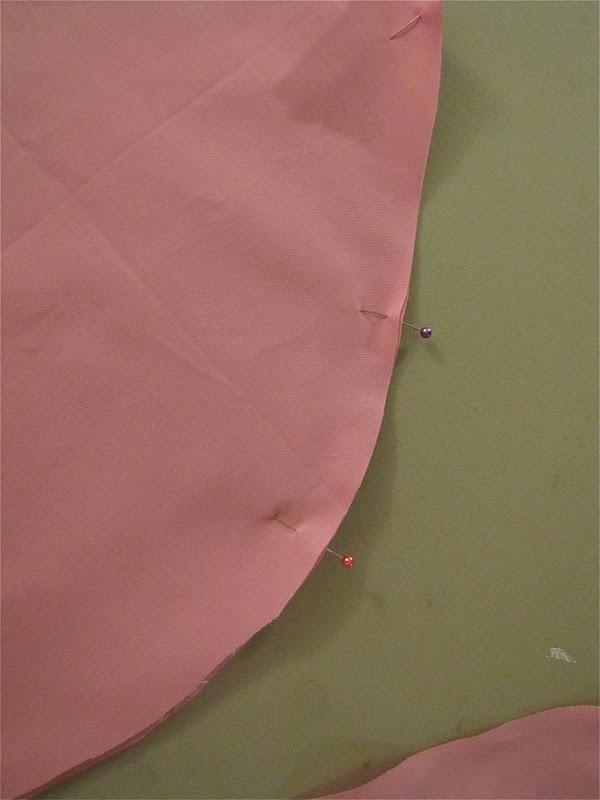 Slide the hoop into each of the six pockets you just made on your tulle. So now your hoop will look like this except your hoop will be wrapped with ribbon making it look prettier. Don't be like me... wrap your hoop! Now you are going to put the break back together using a heavy duty duck tape. I wrapped it several times so It was nice and sturdy. Then finish wrapping your hoop with the ribbon to cover the tape. 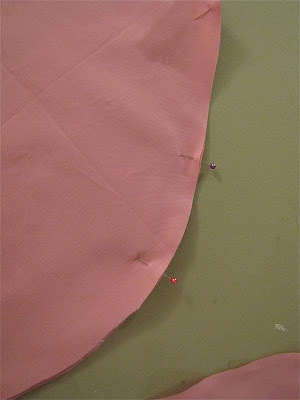 Using your leftover yard of tulle you are going to cut three strips to tie to the hoop. This is what you will use to hang it from the ceiling. My tulle strips measured about 3 feet long and then I cut off some at the end once I determined how low I wanted it to hang from the ceiling. Tie the ends of each strip onto the hoop so that they are evenly spaced apart with equal sections of tulle in between them. Now you are going to bring the 3 strips together in the middle and tie a knot. Mine measured about 12" in length from the knot in the middle to the hoop. Make sure they are even so your canopy won't be lopsided. Now you are going to put the petals on sliding the strip of tulle above the knot you just made through the button holes of each petal. If you make the knot big enough it should hold your petals in place but you may want to add a safety pin if they slide through. Slide the large ones on first arranging them in a flower pattern and the medium ones on second. Then add the small green petals. After you've determined how low you want it to hang from the ceiling cut off the excess if any and tie a knot at the very end of your tulle. So now you have this. 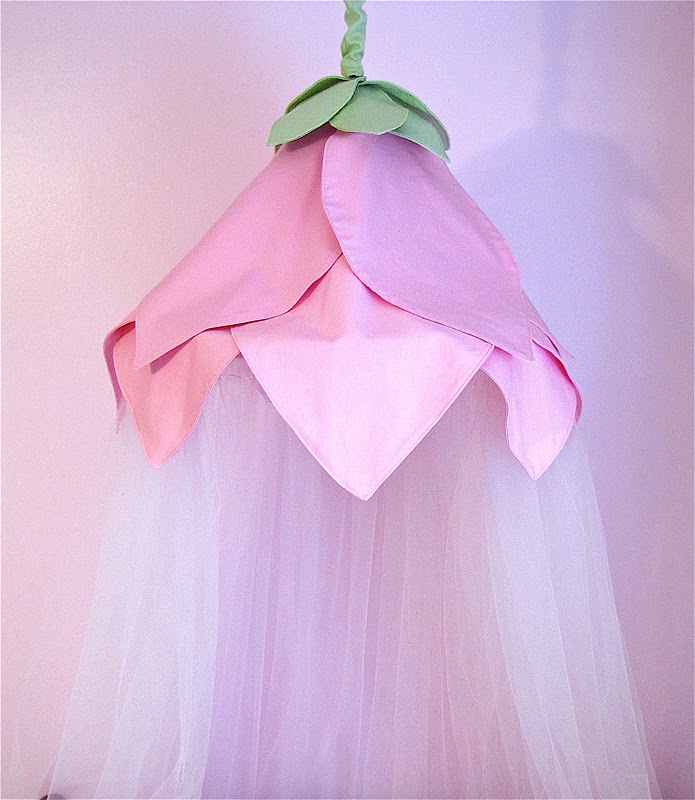 I created a cover to add over the tulle piece that attaches to the ceiling. I cut a strip of fabric about 3 1/2" wide by 27" long. Finish the top and bottom edges by folding them under about 1/4" and sewing. Then fold it in half right sides together and sew together at the open edge. Flip it right side out and you've got your cover. Pin a safety pin to the end of your tulle. And push it through the cover. The safety pin just makes it easier to get the cover on. I used this hook to attach it to the ceiling. Since it was pretty light I didn't think it needed a heavy duty hook. But they do sell bigger ones at Lowe's or Home Depot if you'd rather use that. She has had it up for several months now and it has never fallen down. Although she did pull it down once during a heavy duty pillow fighting/bed jumping party she had with a friend. I'd love to see pictures if you decide to give this a try! Feel free to email me if you have any questions! Linking up with some of these fabulous parties. Check them out! This is brilliant and I LOVE it!! I am going to try this one, thank you! Wow you are a super mom. I"m not sure I'd be willing to take the time, but it looks great! That is adorable!!!! Thanks for the lovely comment on my blog. I love your blog and I am following you back!!! 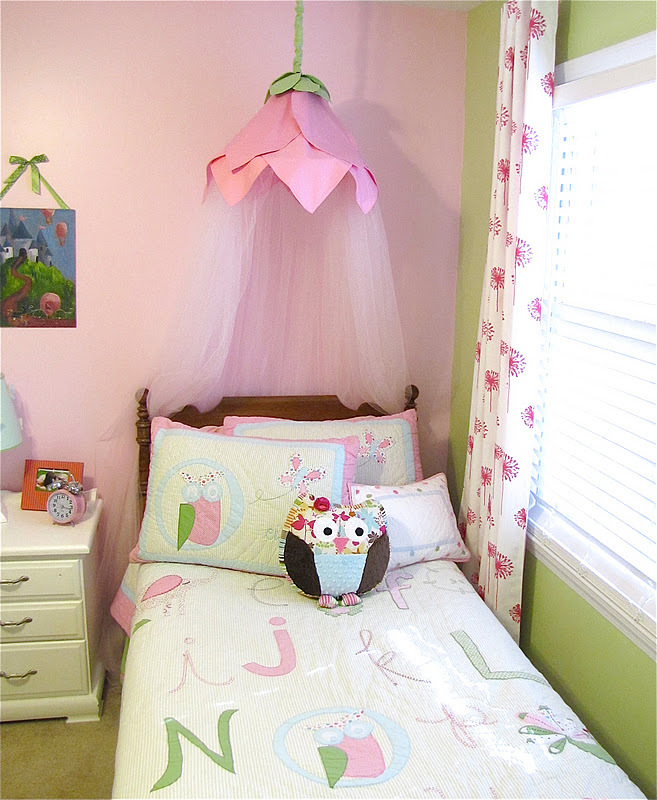 My daughter would love this canopy! 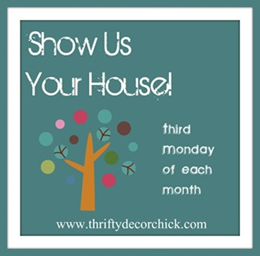 I have a little sewing and fabric craft linky party I'm starting tomorrow and I was wondering if you could be so kind to stop by and post it? Thanks so much! Love it! Hope you can share your creativity at my Creative Bloggers' Party & Hop.